Get a cab to The NIA for £1! If you’re heading to the NIA Birmingham this month, you’re in luck! 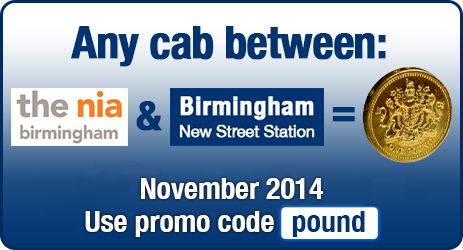 We are excited to announce that for the whole of November a cab between Birmingham New Street Station and The NIA Birmingham is only £1! 2. Enter the promo-code ‘POUND’ at the payment page.